So 97 little zander were introduced to the fens and the population took off and spread the waterways of the country. It's rare to catch zeds in the fens these days . What would happen if another 97 were introduced now? Loads of fodder fish, less pike, what's changed? What would happen if another 97 were introduced now? Waters containing zander, pike and perch seem to go in cycles. One species booms while another fades, but the cycle slowly turns and the faded species make a come back while another declines. The Fenland zander will come back. I'd suppose it might be worthwhile looking at what/who's eating them? It's a sh1tter we know, but they are faced with quite a few more predators these days. To talk water, I fished the Fens pretty regularly between 1995 - 2011 and the biggest difference I noticed in the waterways during the latter years, was the lack of run-off in the summer months and the total crystal clear clarity which infiltrated many of the waters. By the time I moved, some of the deeper drains were gin clear. One of the deeper drains was full of Zeds in the mid-to-late 90's, yet a friend and I fished a good number of sessions over 3 successive winters in the late noughties on it and didn't see a single one, they were/are gone! They are taking there time started fishing the fens in the seventies (bait) zander were being persicuted as i turned to trout, (mid seventies) missed the boom time later on. Started back on the fens with the fly in 2000 doing it ever since had some good moments but things slowed right down in the last 5/6 years no sign of schoolies coming through, reproduction just does not seem to be happening on the fens. If you do get one nowadays it will be a decent sized survivor. Pike wise, jacks are still coming through. With no science to back it up but just my thoughts - Is it possible that of a mixture of angler pressure/predation and the fenland pike re-asserting their natural dominance meaning that zander are in the food chain more often these days?...a similar situation also seems to be happening over here on the lower Severn with the BIG zander very few and far between but lots of smaller ones evident...I do hope that it is cyclical as has been suggested and that there will be a re-surgence of decent zander in the future - just not sure how big the cycle wheel is!! I remember you mentioning this Nigel a while ago, is the Eel man still finding them? Not bumped into him since that day Dave, three seasons ago. What Paul (Barbelist) mentioned about angling pressure, very hard to see pressure on the fens, miles and miles of water, with odd good sized fish still around, to be honest the fish I caught from 2000 onwards were averaging 5/6lb and up to double figures, only ever had a few small ones those days from the waters I went to. I still fish there, but are now very rare/non existent. Can't really comment on the eastern fen waters like the Ouse, only boat fished it twice and caught schoolies! 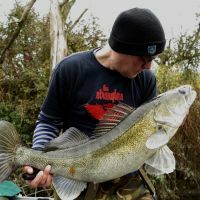 the best only 5lb, well known for it's quality sized zeds and it's plentiful abundance of up and coming schoolies, perhaps Mark Phillips might be able to shed some light on what's happening there now? Away from the fens, on the reservoir front, Rutland has had zander in there for around 15+ years now with schoolies first being caught, one of the early seasons when they started showing saw trout anglers catching juvenile/ immature fish on small flies close in off the bank, this by the way happened in one season, and one season only. Nowadays the immature fish seem to be out in the deep water, with those out fishing for mature zander from September onwards report adult fish coughing up young zeds now and again. Not many repeats in the business of catching BIG zander. One or two fen waters still offer a reasonable prospect for zeds. Anywhere too easily accessed will have had pot hunting pressure now but if you are prepared to walk -or have access to a boat- there are still fish there to be caught. Barry Mc made a few good points on the declining Zeds in the fens. mitten crabs eating their eggs due to Zeds nesting in the river beds makes them easy pickings and also the run offs in the channel meant that loads of baby Zeds were getting caught up in the margin weed and dying due to being left high and dry. All this will have some impact and must be part of the reason that they are now thin on the ground. Might be cos they taste better than pike . I fell in love with Zander fishing on the Fens in the late 90's when I caught a 13.2 while Pike fishing. I spent the next 10 years fishing more for Zeds than Pike and most of that was on the fens and Pits in the area. These were great times, mainly fishing weekends without sleep then the long drive back to the NE on a Sunday night! 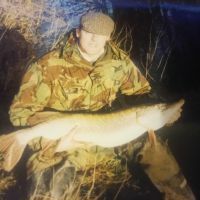 Had some memorable catches but sadly, as we all have seen, the catch rate declined so much that several weekends were blanks apart from the odd Pike that made an appearance. I've not fished the Fens much since 2011, the few trips I've had are targeting the Pike as I did previously. I do hope they make a comeback in that area, in the meantime, I must do some research on the Trent to get my Zander fix once more.